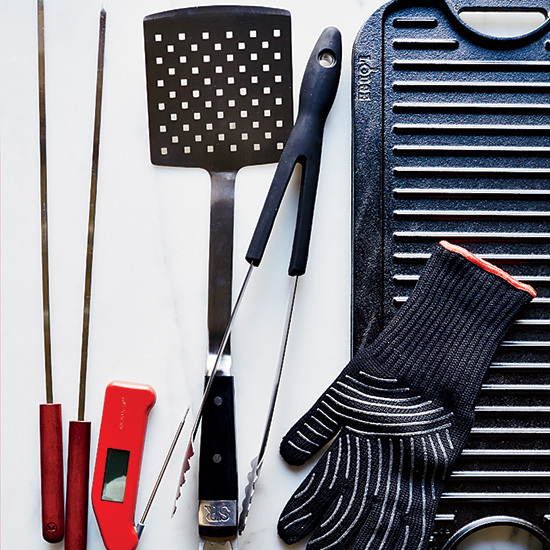 F&W Deputy Editor Christine Quinlan shares her top picks for 6 essential grilling tools, from oversized tongs to the thermometer that's preferred by the pros. The flat shape means food won't spin. $15; bbqguys.com. A chef favorite, with digital sensors. $96; thermoworks.com. Barbecue guru Steven Raichlen's jumbo model has a built-in bottle opener. $18; amazon.com. Oversize tips make it easy to grab anything, big or small. $15; oxo.com. Heat-protective with a silicone grip, so utensils don't slip. $35; weber.com. Reversible, with a griddle on the flip side. $75; lodgemfg.com.